Rain barrel stands are made from recycled end-cuts of 2×10, 2×8 and 2×6 lumber, so no additional trees were cut to produce this product. 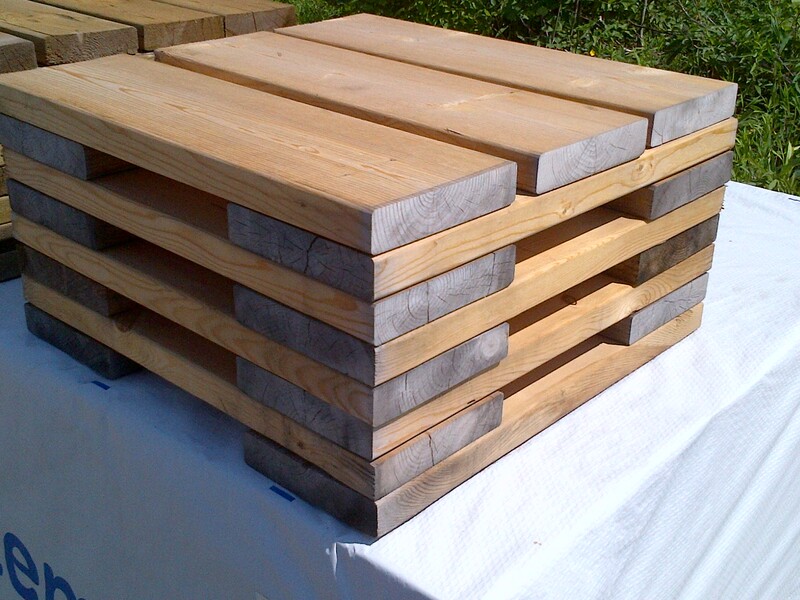 Boards can be stacked in alternating directions, 8 levels high to create a stand that is 1 foot tall. A solid base of gravel, bricks, cinder blocks or a 2×2 patio stone is recommended. The exact same boards can be secured together with 3.5 inch wood screws to create a 2 foot tall, bench-style stand, however the wood screws must be purchased separately from your local hardware store. Our rain barrels stands are made from recycled end-cuts of 2×10, 2×8 and 2×6 lumber, so no additional trees were cut to produce this product. The boards can be stacked in alternating directions, 8 levels high to create a stand that is 1 foot tall. We recommend using a solid base of gravel, bricks or a 2×2 patio stone. The exact same boards can be secured together with 3.5 inch wood screws to create a 2 foot tall, bench-style stand, however the wood screws must be purchased separately from your local hardware store. We receive the wood in strapped bundles containing hundreds of pieces. Some bundles are wrapped in tarps and others are not. The lumber is in its natural state and has not been treated, stained or painted and may have arrived wet, discoloured or weathered. In most cases, every single piece will have at least three surfaces that are in excellent shape. Before constructing your rain barrel stand, consider allowing the wood to thoroughly dry and treating it with a sealer, stain or paint to extend the lifespan of the wood. Organize the pieces in advance so that the best sides are facing outward and so that the very best pieces are used to construct the top surface. The most weathered pieces can be easily hidden out of sight. A solid base for support comprised of a 2×2 foot patio-stone, pavers, bricks, blocks or stones is recommended. The stands can be setup in two formats. 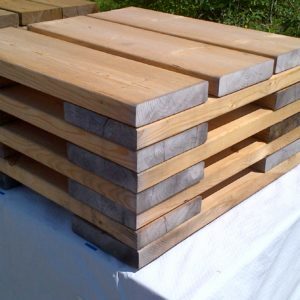 By stacking the boards, they will be 1 foot tall. By assembling them with wood screws, they will be 2 feet tall. Multiple stands can be stacked to provide additional height. 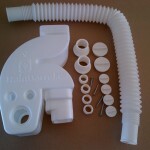 Want to order one and maybe a rain barrel or downspout diverter too? Click here to see a list of all sales being hosted by our non-profit partners. If you have any questions you can leave a comment or email Info@RainBarrel.ca.